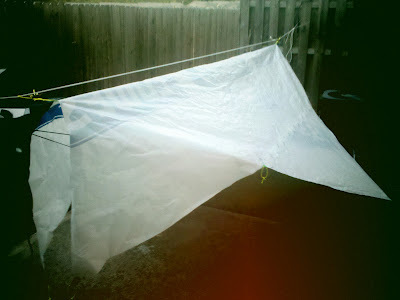 So I re-created an Ogee tarp (by Gargoyle fame on HF.net) out of Tyvek. Sorry for the picture quality. It's REALLY bad. Unfortunately the bridge is EVER so slightly too wide. So it rubs. If my math had been better I'd have made it a foot wider and it would have not rub. DOH! Oh well, think the next Tyvek tarp I make I will take realityguy's advice and make it a rectangle. Probably 9x12. Also, seams were done with Tyvek tape. Corners were two layers of tyvek tape. Tie outs are duct tape and tyvek tape. Duct tape to make the loops (stuck back to itself) then the tyvek tape covers most of where it attaches. This worked VERY well. Also used mason line for the guy lines and prussics and nylon cord from WW for the RL. All the things aside from size being too small worked EXTREMELY well. Last edited by JBRanger on Wed Sep 28, 2011 9:21 am, edited 1 time in total. I wish there was a way to get the tyvek cheaply without the logo. I think some folks tried to put it through a washing machine but I don't think they were successful. I like your hammock. Is it diy? I was thinking of the same idea for the poles. How is the end made? Is there a rope running through the ends of the hammock to connect to the poles, or just the hammock fabric? Unfortunately the bridge is EVER so slightly too wide. So it rubs. If my math had been better I'd have made it a foot wider and it would have not rub. I had to read that twice..then realized you were talking about the hammock in the first part and the tarp in the second.. I'm braindead today. Does that bend the bridge hammock poles at all without continuous support or ties across the middle portion?..just wondering.Is it removable to use trek poles instead? It's probably not a bad idea to have that liftable side to the tarp for access to the hammock instead of brushing your shoulder along a cold damp tarp accessing it from the end...Do you think a square one would work the same way,lifting the center of the side?It might require a couple extra tiedowns along the bottom edges but they don't add hardly anything for weight.I found a few extra tiedowns are worth the extra effort to add if it gives you numerous different pitches for the same tarp.I use my tarps as much as a supplemental extra covered space with tents as used with hammocks.In one case I was glad I had the extra tarp along as a secondary barrrier to a storm..and probably saved my tent from blowing away or torn to shreds. 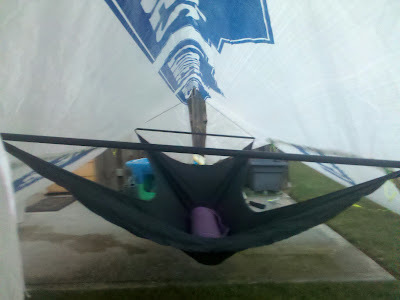 The hammock is one from Grizz off hammockforums. It is VERY nice. The suspension lines come down and make small loops just before connecting to the hammock body. The poles have little tips that slide into these loops. The body of the hammock is simple. I can lay it out and take pics if anyone is interested. As for the rubbing comment... yea, sorry. was talking the tarp was rubbing on the poles. If I'd made the tarp wider I could have made the poles not rub. As for trekking poles being used? I'd LOVE that. So I wouldn't have to carry extra gear. This is one thing I'm looking into. Trek poles..should be an easy conversion but I don't know what pockets or loops in the hammock you have.I build all my tents for trek poles instead of packing something extra..I need them to fend off urine lovin' mountain goats anyway around here. At least you'll get visitors from the county inspectors. I'll get the permit next week sir, come back then. Does lowes have short rolls of tyvek? I'm pretty sure tyvek only comes in a 100'x9' roll. I have some I could send ya zelph. How much would you like? I don't know how much is left on the roll, but its a good bit.